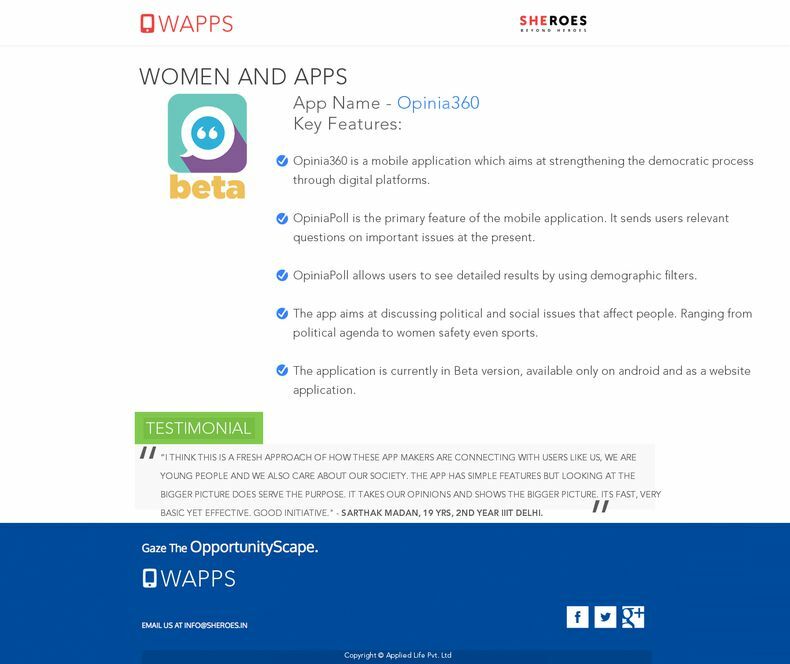 Opinia360 is a mobile application which aims at strengthening the democratic process through digital platforms. It sends intelligent and socially relevant, multiple-choice question to the users, crowdsourcing solutions to the issues that are important to us as a country. Once answered; users can see the detailed results, real time and use them for more informed choices and opinions. We see our app to become the biggest medium of crowdsourcing solutions from different sections of the society. Ranging from political agendas and newspapers we see our app as a resource for reliable, fast, and authentic and crowd sourced opinions. Users can gain a better understanding of how India as a country and make our democracy a stronger democracy. In definition, Opinion 360 is a platform that crowd-sources people's opinions on the issues which affect all of us. But in spirit, it is a lot more than that. The power of opinion being reserved with the high ranking and prime time figures is an upsetting reality. How many times have we heard them at our behest? “India wants to know” ... “India does not want this” “India will not forgive you”. How do they reach such incisive conclusion? Do they have a tool which actually objectively gauges what India wants? If not, then this is not what a democracy is supposed to be. In fact, it is the anti-thesis to democracy. And that is why we created Opinia360. What are the issues that are usually discussed on the App? The app aims at discussing political and social issues that affect people. Ranging from political agenda to women safety even sports. How do you think the app can make a difference? Opinia360’s vision is to activate a society where voices are heard, no matter how small. We would like to create a platform which will enable governments around the world to receive direct quantifiable input from the people they were elected to represent. 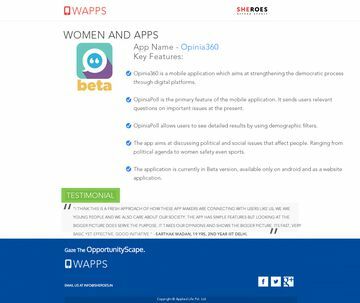 Also the application allows people to explore how opinions vary between age, gender, state, occupation, and religion or income group. Our users can draw their own conclusions and gain a deeper understanding of how different parts of society think, at any given point of time. Not only does this spread awareness but also dispel myths. What platforms can the app be used on? The application is currently in Beta version, available only on android and as a website application. How do you make an impact on people who cannot download the app? At Conversations Unlimited, we choose a current topic and invite people with different views for a discussion. Our aim is to create a community of individuals with ignited minds who can bring fresh perspectives into light and have meaningful conversations with each other. Photowalk “I SEE HOPE” is a call for artists who can express through their lenses, create and capture images that redefine how we perceive life. Enthusiasts over professionals, hope over criticism.We see hope and we are determined to spread the message. What makes this a must-have app? The application does not fall under the utility application sector. However, we like to believe that the idea behind the application is such that it is creating a need for people to exercise their democratic power every day. Issues no matter how small or big, if creates a critical mass for its support can become a catalyst for a better society.